Air fryers are the rebels leading the new wave of kitchen revolution, and actually ‘we love em’ It may sound kind of funny but truly they deserve the attention for the great benefits we get from using them. Air fryers are able to completely fry your chicken, your fries and much more without a drop of oil. This is really important when you consider the fact that majority of the fat content in all these fried foods come from the oil with which they were fried. So many air fryers in the market but our choice for today is the tantalizing Nutrichef Air fryer. Why? Let’s go for model PKAIRFR28. 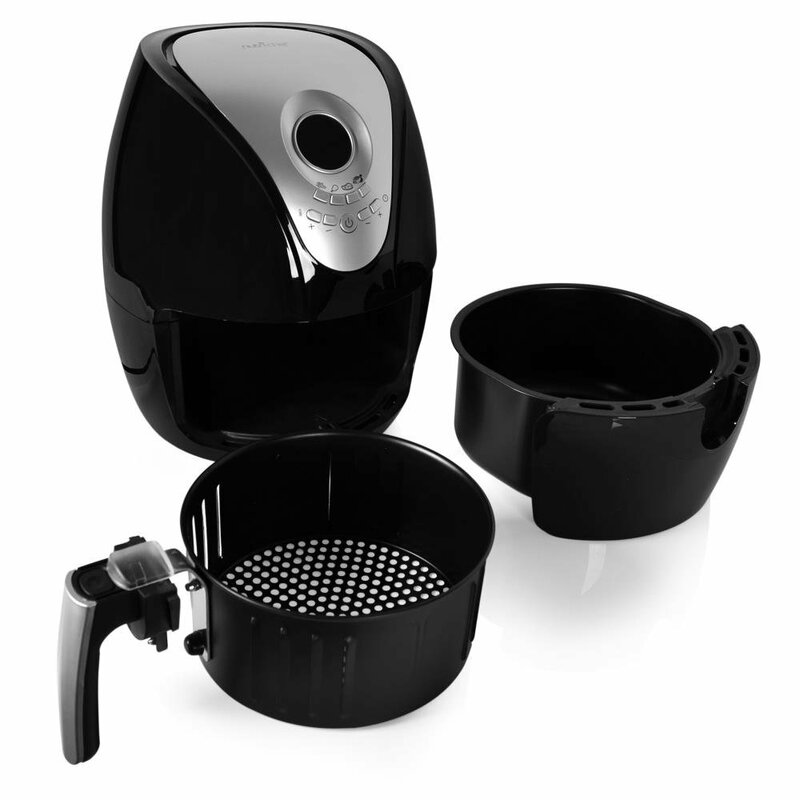 Also available other Nutrichef Airfryer Models PKAIRFR42 and PKAIRFR54. The NutriChef Digital Electric Oil-Free Air Frying Cooker: What’s up with it? The Nutrichef brand has been around for a long while and they’ve produced several kitchen appliances that have found their way into our homes because of their quality and style. The Nutrichef Air fryer is certainly one of their best production. The air fryer uses the mechanism of rapid air circulation to completely fry whatever is thrown at it with little or no oil. This works by circulating hot air around the food at a very high speed, to fry the food to a crispy outer layer and an inner layer that is moist and delicious. Coming in a black color, the Nutrichef Electric Air fryer weighs about 8.3lbs and has a measurement of 11 x 11.2 x 12 inches in dimension. It comes with a 2.6L frying basket and a non-stick pan with a capacity of 3.2L. 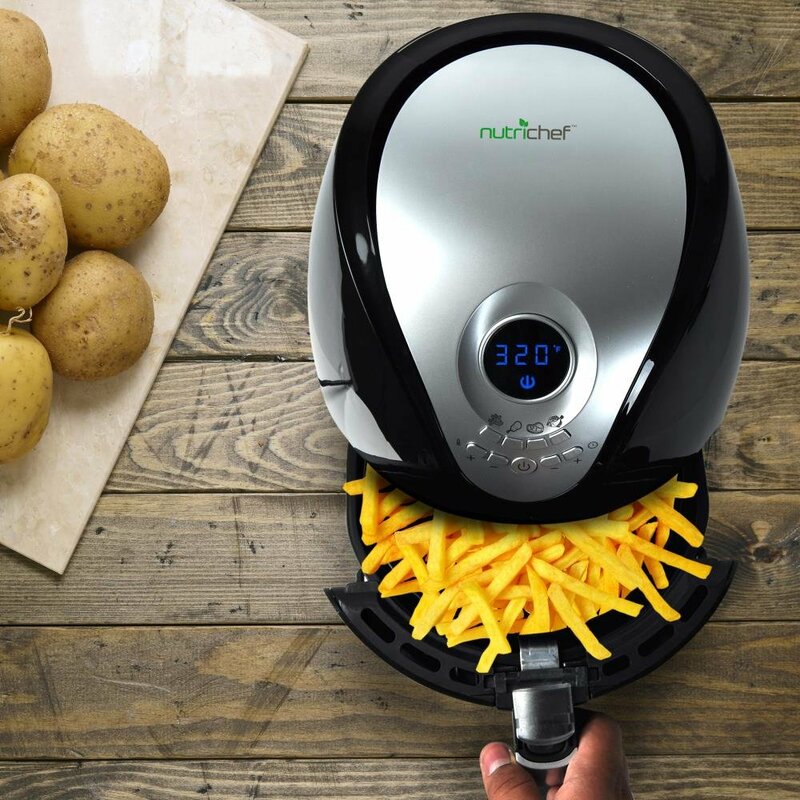 Why have we singled out the Nutrichef air fryer? Because we know you would need it. Why should you need it? Because you are going to find out now. There are several ways the air fryer can find its way to your heart. From the simplicity that made it absolutely easy to use, to the digital control interface with inbuilt preset cooking modes for stress-free cooking. Many love it for versatility, being able to grill, roast, broil, bake and do much more along with frying. There are so many reasons that would make you need this amazing technology, not to even talk about the affordability that has made it a top choice appliance for a lot of shoppers. Whatever your basic needs in an air fryer seem to be, hardly would the Nutrichef Electric Air fryer not meet the majority part. The Nutrichef Air fryer is richly spoilt with a multitude of user-oriented features. Let’s find out how many we can talk about right here. Capacity: The air fryer comes with a frying basket and a non-stick pan. While the frying basket has the capacity to fill in 2.6 liters of your favorite foods, the cooking pan has a larger capacity of 3.2 liters. This is enough to cook for a family of three to five, although, it will also depend on the type of food. Technology: The air fryer operates using rapid air circulation, a technology that allows the air frying to fry foods in a more even and perfect manner, an advantage over many of the lower end fryers. Temperature Control: The temperature starts at 176F and maxes out at a high 392F. This is enough guarantee that no matter what the temperature level any certain food type will require, the Nutichef has got your back. What more? Rather than program certain static temperature degrees for cooking certain sets of foods, the Nutrichef Air fryer is offering you the flexibility to tune the settings to your own preference to achieve your own preferred taste. So superb! Auto timer: There is this option to set a time period during which your cooking will take place, after this set time, the air fryer stops working. There is also another inbuilt timer that automatically shuts off the system after 3o minutes of inactivity. So you know your safety would never be compromised. Versatility: The air fryer is able to grill, bake and all that despite its small size, it is capable of replacing your convection oven and can be the major cooker in your kitchen. Utility package, call it that. Power: The heating element is powered by a wattage rate of 1350W. It also has a voltage of 120V. The air fryer comes loaded with a frying basket and a non-stick pan. However, there are a few accessories that you may need for several cooking processes. Though these do not come with product, they could easily be bought on Amazon. 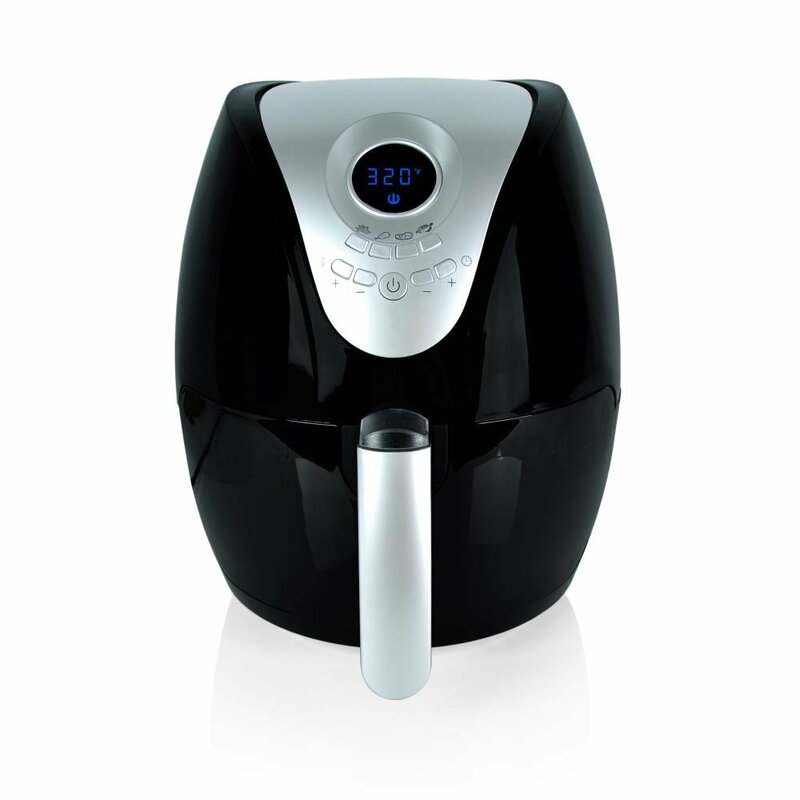 Earlier on in our Nutrichef air fryer reviews, we’ve mentioned how painless it is to put this product to use. You would see that in three simple steps. Remove the drawer and load your food. Wait for the short period and then your oil-less and healthy meal is done. Afterwards, remove the parts and clean them. Cleaning too is as breezy as the way you’d use it, the parts are non-stick and there is no oil to splatter everywhere with grease, so it’s very easy to clean with water. Yes, water because they are dishwasher safe. Cool and easy to use. Able to cook a wide range of foods. Helps to maintain good health with oil-less meals. It uses stain resistant materials and it’s painless to clean. Perfect for chicken, producing delicious and crispy results. Handles frozen foods perfectly but not the same way with wet ones. The Nutrichef Air fryer is undoubtedly a very efficient air fryer, it has a lot of features combined to give the best results you can get from an air fryer. It’s worth every penny of the money and it’s nothing short of great value for your money. Considering the benefits of air frying, with a couple of extra features the Nutrichef Air fryer has to offer, the Nutrichef is one air fryer you should strive to have if you don’t already own an air fryer. The Nutrichef air fryer is still affordable despite the premium quality it has to offer, if you are looking for the best air fryer to buy, the Nutrichef would certainly do you a lot of good.